Ensure the pipes in your home or business always flow smoothly with our complete plumbing repair and installation services. We perform complete bathroom remodels, including full restoration of your walls and tile after we make our repairs. 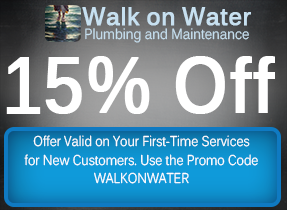 Leaky water heaters and clogged drains are no match for the experts at Walk on Water Plumbing and Maintenance. Based in Albuquerque, our locally-owned company assists in every facet of plumbing repair and maintenance for residential and commercial customers in both Albuquerque and surrounding areas. Our reliable and friendly plumbing contractors establish long-term relationships with clients by providing personalized service and 100% customer satisfaction. We are a team of perfectionists; our owner personally oversees every project to ensure you receive the highest-quality service and parts. Our attention to detail and commitment to integrity set us above the rest. We are licensed, bonded, and insured. Professional references are available upon request. Contact our company today for all your plumbing, heating, and cooling needs.